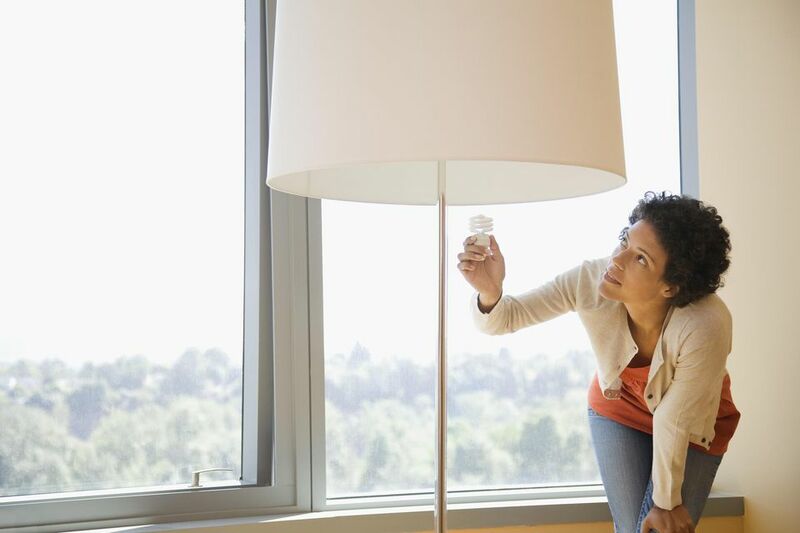 If you have a socket that light bulbs just won’t work in anymore, or won’t work properly in, you’re going to need to do something to correct that or abandon the fixture. If it’s in a chintzy little table lamp that you picked up for a dollar at a yard sale ten years ago, maybe you’re looking forward to replacing the whole thing. But if it’s in your $2,000 Mission floor lamp or the chandelier over your dining table or some other built-in fixture, that’s another matter. Then it’s probably worth repairing. Just to be sure the problem is the socket or the wiring, do a little testing. If you haven’t already done so, troubleshoot the light bulb first. Once you’ve done that, and determined that the problem isn’t the bulb, it’s time to look into the socket itself. You can do this with a non-contact voltage tester. There are a lot of tests that these handy little pocket testers can’t do, but this is one they’re made for. Turn the power off (if it’s a portable fixture, unplug it). Take the ​bulb out of the socket and turn the power back on (plug it in). Use your non-contact tester to see if the socket has power. Turn it on and get it close to where the power should be. In an on/off screw-in socket, that’s the brass tab in the center at the bottom. In a 3-way socket, it can be either the brass tab in the center of the bottom, or the small tab off to the side. In a fluorescent tube fixture, it’s the lamp holders at each end—the tombstones—and in a GU10 socket, it’s the two holes where you plug in the light bulb. If you don’t find power, scan down to replacing a socket. If you do, turn the power off before proceeding. If your fixture takes bulbs with a 2-pin GU10 bayonet base, and you don’t have power coming into the socket, you’ll have to take the socket apart to see if you can repair it. You may need to replace the socket. If the socket takes screw-in bulbs, the round brass tab in the center of the bottom of the socket should have the incoming power on it (the neutral is connected to the threaded shell). The round tab should also be springy, to help it make good contact with the tip of the bulb. A common problem, though, is that over time that tab can lose its spring. Once that happens, it may not make good contact anymore. The good news is that it is often easy to correct that problem. You need to make sure the power is off before doing this. If the socket is in a portable fixture that plugs into a receptacle, unplug the cord. If it’s in an installed fixture, this is one time you shouldn’t rely on killing the power with the wall switch—it’s too easy for someone to flip it back on at the wrong moment. Turn the power off by flipping the circuit breaker or removing the fuse in the electrical panel instead. For an on/off socket, or a 3-way socket that won’t power the higher-intensity element in a 3-way bulb, once you know the power is off, take a close look at that brass contact. You should see a relatively narrow piece extending from it to connect it to the socket and the power. What you want to do is to use a thin but sturdy tool, such as a small flat-blade screwdriver or a metal nail file, to lift the other edge of the brass tab gently. You don’t want to overdo it and damage the tab. Just a small lift—maybe 1/16 of an inch, should be enough. Once you’ve done that, and it looks like the lift is staying in the tab after you take your tool out, put on a glove and screw a good light bulb in. Again, don’t overdo it. Overtightened bulbs are probably what damaged the contact in the first place. Then turn the power back on and see if that fixed it. If it did, great. If not, kill the power and try lifting it a bit more. If that still didn’t cure the problem, there may be a problem with the neutral wire. It’s time to test for a complete circuit in the socket. For a 3-way socket that won’t power the lower-intensity element in a 3-way bulb, the loss of contact is with the small metal tab that should be sticking up between the center contact and the shell of the socket. If that little tab is broken or missing, you’ll need to replace the socket. Often, though, it’s just been flattened enough that it won’t make good contact anymore. To repair that, make sure the power is off and use a small pair of needle-nose pliers to pinch the tab and straighten it up. It will probably be flattened toward the center of the socket, so you’ll need to send the pliers in from across the socket (from the opposite side of the opening). Pinch the tab with the pliers and bend it more upright. Once you’ve done that, set the pliers aside, put a glove on your hand, and install a 3-way bulb that you know is good. Then turn the power back on and see if it’s working. If not, you can try bending it one more time. If that still doesn’t fix the problem, it’s time to replace the socket. A 3-way socket that will power either element in a ​3-way bulb has a complete circuit, so there’s no need to test for that. One final tip for fluorescent tube fixtures: Check the tombstones. Those are the pairs of lamp holders that each tube fits. Make sure they’re held firmly in place and aren’t damaged. Replace any that are. What Is Wrong With My Light Fixture? What is the Best Way to Check and Repair Holiday Christmas Lights? How Do You Turn off the Power at Your Home's Breaker Box or Fuse Box?